So before I begin discussing some of the television shows of late, it is time for a confession. I’ve been seriously considering rescinding my policy regarding no book reviews. The policy existed for a few reasons. There are concerns about conflicts of interest (promoting friends or nay-saying authors within my genre, etc) and also about the risk of creating enmity over honest critiques of works that fall below perfection. Although a heavy helping of tact and constructive criticism is essential to kaizen, there will always be those who are angered by the truth. However there is a dearth of purposeful reviews. Product sites are host to star-ratings and plenty of unconnected praise, but they rarely go more than skin deep. What I’d like to see is true analysis; a discussion of themes, dissection of character motivations, breakdowns of any technical mistakes found by proofreading such as typos, misspelling or formatting concerns. The author or editor must request the review in the first place. Friends and colleagues can request, but I will mention a prior relationship with them alongside the release. The work must be available for purchase on at least one major outlet– This is to prevent trying to obtain “free” proofreading before release. If anyone feels comfortable with these arrangements, feel free to contact me once the official page is available with my email. You can also simply comment here. These reviews are spoiler free, but are lighter as a result. I’ve finally cracked the seal on watching the latest season of Game of Thrones. Two episodes in and something was very amiss. There was the story line to Dorne which feels hampered by a missing faction elsewhere (which was present in the books). Likewise, the situation at the wall involving Davos Seaworth (Liam Cunningham) seems to have materialized from effectively nowhere, resulting in deal-making with someone he ought to hate. This proved frustrating personally as Davos is one of my favorite characters. These incidents are justifying my concerns that deviations and omissions from the source material are starting to hamper the series. Thus the screenwriters have begun hot-wiring threads together, hoping to keep the engine running. Yet the 10-episode format limits available time to smooth the wrinkles of these transitions. George R.R. Martin’s novels give the impression that he’s fairly good at avoiding pointless tales and subplots. Even the things that seem unconnected (and there are many, many such elements) often connect and trigger events down the road, although sometimes these have to be taken with a hint of salt and faith. Why the screenwriters didn’t respect this more, I cannot say. But their hastiness instills me with patience for Martin as he carefully crafts the final installments. The book series is, after all, his Magnum Opus. This is not to say that this season has all been bad. Watching a childhood dream come true for Tyrion (Peter Dinklage) on screen was rather amazing. And Daenerys’ (Emilia Clarke) complicated situation has my full attention. It simply maybe one of those moments when a few bad scenes must be overlooked to arrive at an otherwise good season. Time will tell. Going from fantasy “past” to science fiction “future,” I’ve finally cracked the code that is The 100. There has been a trend where the first few episodes seem to have it rough, with character connections rampantly making or breaking. But as the story gets closer to mid-season, the alliances are finally sealed and the show tells the plot that it wants to tell… and quickly gets better for it. This seems why the early episodes feel inorganic as the characters play musical chairs with pairings, the emotions they’re supposed to portray being jerked about. It could be that the producers have been trying to tweak and figure chemistry between its stars to best please its audience. Another peculiarity has been the flip-floppery with regard to killing its darlings. In the prior seasons, killing characters was sometimes a painful, drawn out affair. This season saw sudden deaths claim two characters from the show’s dramatis personæ– one who resulted in a fair amount outrage. Be forewarned, there are spoilers within this news link if the reader is curious. However, the death of this person was absolutely necessary to advance the plot in a vital direction. And curiously, it seems we’ve also learned more about this character post-death than anytime while they were alive. And, as usual, it’s the pow of each season’s finale that keeps its fans coming back to next season’s slow start. That’s one thing we’ve learned to count on. It was unclear what exactly was missing from this season of Unbreakable Kimmy Schmidt. Only after being put side-by-side to the first season does the issue stick out. The first had an easier time weaving its most outlandish elements into the central plot. To this day, I still giggle over Titus Andromedon’s (Tituss Burgess) amazing Pinot Noir music video and the autotuned remix of his “Gonna Be Famous” (which is exactly what happened as a result). And Kimmy (Ellie Kemper) had her flashbacks to life in the bunker (occasionally revisited this season but not as often nor as rewarding). But this season, bizarre antics came more out of the blue, and were less memorable. The plot-juggling was weirdly handled this time. Titus’ cliffhanger ending of last season was turned into an episode and then resolved with very little impact, although his follow up plots were simultaneously more interesting and entertaining. But less so for the rest of the cast. Jacqueline White’s (Jane Krakowski) hunt for spiritual meaning kept jabbing at a political cankersore. Lillian Kaushtupper (Carol Kane) labored against the gentrification effecting her neighborhood to no immediate effect for all thirteen episodes, although the ending suggested an intriguing thread for the third season. Kimmy’s story lines were a Boggle board; first on her forbidden relationship with Dong before folding into deeply embedded psychological issues– resulting in animated scenes that were strange and out-of-place. Then there was the dynamic between her and Jacqueline that seemed little more than filler. Her finale simply didn’t have that coveted “full circle” plot that Seinfeld and The League were renown for possessing. The first season of Unbreakable Kimmy Schmidt accomplished this in a less karmic way then those other shows, returning to the origin of the problem. But the second season simply didn’t try, arriving at some catharsis that doesn’t feel as meaningful as one may hope. That’s all for now. Keep an eye out for Penny Dreadful and Halt and Catch Fire reviews next time. Yesterday night I saw the last episode of NBC’s Awake. I suspect that Fox spoiled me by continuing to renew Fringe despite the ratings drama, and thus I hoped that NBC might do the same. But they simply could not chance a second season of the intriguingly psychological police drama. 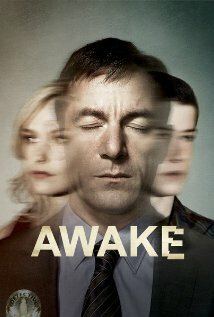 I’ve briefly covered this before, but Awake is the story of detective Michael Britten (Jason Isaacs), who recently suffered a car accident with his wife and son (Laura Allen and Dylan Minnette respectively). Each time he goes unconscious, be it sleep or otherwise, he wakes up in the “other world.” The two worlds are different enough; in one his wife survived but his son did not, and vice versa. The differences do not end there. The world of his wife is tinged with an orange/red color, where he answers to psychologist John Lee played by BD Wong of Law & Order: SVU, and is partnered with rookie Detective Vega (Wilmer Valderrama). The other world is a bluish green, where he has sessions with psychologist Judith Evans (Cherry Jones) and solves cases with long time partner and friend ‘Bird’ Freeman, played by Steve Harris. In both worlds he answers to Captain Harper (Laura Innes). But all characters exist, or have existed, in each of the realities. The detective cases in one world always seemed to have unexplained details that related to the other. As Britten picks up on these details, it scares his partners and boss with his preternatural instincts for solving cases. Clues seemed to come out of no where. Cases get solved with speed that would put Sherlock Holmes to shame. But all the while, there are details that make no sense to the case, building the clues in Britten’s mind. These bizarre and esoteric clues lead Britten to conspiratory discovers surrounding the night of his family’s car accident. The show’s creators, upon finding out about the cancellation, attempted to end the show on a satisfying enough page. They did not have enough time to expand the story beyond a low level plot of a corrupt police drug operation. There was no conspiracy that explained Britten’s mental condition as I was first led to believe. That was completely his own doing. Instead, the show takes advantage of its twin psychologists to rationalize the unusual nature of Britten’s twin mindedness. The plot aspects of each episode did not always make the greatest of sense. The alternate versions of certain suspects created confusion, sometimes without satisfactory reconciliation. I believe that even the show’s writers had a difficult time deciding how to best implement episode plots, and it showed. But I enjoyed the well roundedness of each of Awake’s characters. No character annoyed me. Both the wife and son got considerable on screen time, and their irrationalities were rationalized by either Wong or Jones’ character. There was not time to really develop either of the partners Freeman or Vega, but their personalities and mannerisms worked well. I enjoyed Freeman’s concern for his partner and level headedness, and Vega mixed an excellent blend of rookism with common-sense regarding Britten’s antics. The show’s conclusion was a rush to Britten’s metanoia. There were scenes of subtle, disturbing creepiness, such as when he spoke to his alternative self through a prison visit. The best scene had to be where Britten walked down the prison hall, while the two psychologists clashed and argued behind him. Lee and Evans jabbed each other with their conflicting philosophies, like brain parents fighting over their child. Lee took on what could be described as paternal instincts, believing that Britten should have taken charge of his dreams and cast the other aside. The maternal Evans however, embraced and encouraged Britten, trying to let his mind naturally accept and heal itself. Given the second to last scenes of the show, it could be suggested that Lee’s denial of the otherworld was a desperate attempt to deny and save himself, a survivalistic instinct threatened by Britten’s fractured psyche. Needless to say, such a whimsical approach to the ending kills the mood. As though the last twelve episodes did not matter in the least to the ending. Despite this set back, I have to applaud the show’s overall innovation and originality. The show is technically a marketplace failure as it lasted only one season. Such first generation experiment often fail however. But the loss often creates artistic seeds from which new, better executed television can be developed, much like how Dark City inspired Inception.